Around 2.5 million Kindles have been sold in the last two and a half years. One million iPads have been sold in a little over a month. Which is better as an e-Reader? The “3G” wireless connection on the Kindle is free. You don’t have to be in a Wi-Fi hotspot to download books, or shell out an extra $100 for a 3G version of the Kindle. The Kindle gives you free sample chapters on any book in their 500,000 book library. The Kindle lets you look up words, highlight passages and make notes (and in a few weeks, you’ll be able to share passages with friends) without leaving your book. Blogs are faster to get through when you have a list of headlines and no distracting graphics. You can get Kindle tech support any hour of the day or night. You can read the Kindle in bright sunlight. You’re not forever having to clean the Kindle screen. The Kindle is lighter. Hold it aloft in one hand while lying on the couch. The Kindle is easier on your eyes than the iPad is, if you’re reading a book or long article. Newspapers and magazines have videos accompanying their stories. Blogs are more useful when you can click on their links. The Wall Street Journal app is gorgeous, and lets you look at a “now” edition, which is up to the minute. It lets you save individual stories or sections. USA Today and the New York Times “Editor’s Choice,” look just like the real newspaper. You can play your iTunes collection while running a slideshow of your photos. You can read the iPad in the dark. You can easily see graphs and charts without the zoom feature that isn’t available yet on the Kindle. The touchscreen is a joy to use. The 3G version has GPS, so you can find out where you are. Besides being an e-Reader, there are endless apps for games, email, social networking, productivity tools, TV shows and movies. A really interesting comparison. 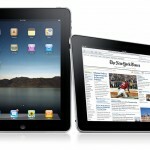 Isn’t the big question “Is the iPad an e-Reader?” and, fundamentally, the answer is “No”. Item 10 on the iPad list tells us that it is something else entirely – more of an Media-Reader. When it comes to reading a novel the iPad is going to be very hard work. However, I don’t see why a new form of literature couldn’t be created by the iPad. Including interactive maps, photos & video in a crime novel or thriller would be very exciting and the Kindle (and it’s like) are never going to be doing that. Check out the “Vook,” video-book, at vook.com. I’ve been reading the free Sherlock Holmes Vook on my iPad but you can also read them on a computer. Videos accompany the stories, telling us something about the author and the setting. I agree that the iPad has huge potential in interactivity.